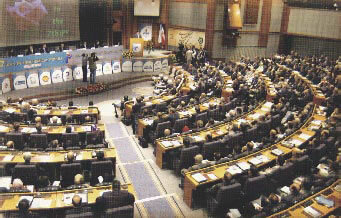 The 7th Iran Petrochemical Forum was held in Tehran on 7th and 8th of May 2005 with the attendance of more than 1500 participants. The Forum was launched with the presence of the Head of the State Management and Planning Organization, Dr Hamid Reza Baradaran Shoraka; Iran's Minister of Petroleum, Bijan Namdar Zanganeh; and the Deputy Minister of Petroleum and President of NPC, Mr Mohammad Reza Nematzadeh. Mr Mohammad Hassan Peyvandi, the Forum Chairman, opened the Forum by welcoming the participants. He then pointed out that this year, as compared to the last forum in the year 2004, registration had increased by 49%, and added that: “The Iranian attendance has increased by 53% and foreign participations by 45%. Today, scientists, managers and traders from 47 countries, representing every continent, are present in this gathering. The great majority of our foreign guests are from Europe and Asia”. The first official speaker was the Oil Minister, Mr Bijan Namdar Zanganeh, who, after greeting the participants, pointed out that “the Islamic Republic of Iran pays due attention to petrochemical projects and this policy is mentioned in the Fourth Five-Year Economic Development Plan”. Zanganeh highlighted Iran's 27-trillion cubic meter gas reserves as a great advantage for the country, adding that: “Our country also enjoys low-cost manpower, efficient infrastructures, proper economic and geographical conditions as well as friendly relations with other countries”. Elsewhere, Zanganeh referred to Iran's achievements in the petrochemical sector and said: “After the end of the 1980-1988 Iraqi imposed war, we produced around 5.5 million tons of petrochemicals a year and we raised that figure to 13 million tons per annum in 1998. Now the figure has reached 19 million tons”. Mr Zanganeh added that during the last year the National Petrochemical Company had put into operation the Fajr Petrochemical Complex, the LAB project in Bisotoun, an MTBE project in Khuzestan among other projects. He said that NPC feels obliged to take advantage of its capacities to be present in international markets and gain a higher position. “We predict acquiring around five billion dollars from petrochemical sales by March”, he added. Mr Zanganeh's speech was followed by a speech given by Dr Hamid Reza Baradaran Shoraka, the Head of the Management and Planning Organization. Dr Baradaran Shoraka announced that Iran's petrochemical industries have registered a remarkable growth in the past years owing to huge investments in this sector. Dr Baradaran Shoraka added that under the Second Five-Year Economic Development Plan, Iran invested around 4.3 billion dollars in the petrochemical sector. He said: “Under the same plan, our petrochemical output reached 14.2 million tons a year from 10.6 million tons a year”. The Head of the Management and Planning Organization stated that during the Third Five-Year Plan, the country gained more than 8.5 billion dollars from selling petrochemical products. “We are supposed to develop downstream petrochemical projects and provide better facilities to those involved in this sector”, he said. The next speaker was Mr Nematzadeh, the Deputy Oil Minister and the President of National Petrochemical Company. Nematzadeh said that NPC is planning to develop new facilities and higher production under the 2005-2010 Economic Development Plan. “We are to produce six million tons of ethylene, 900,000 tons of propylene, three million tons of polymers, three million tons of glycols, five million tons of methanol and three million tons of urea”, he said. Mr Nematzadeh pointed out that the economic environment has significant influence on the long-term development of the petrochemical industry and the rate of utilization of the installed production capacities. He continued that despite the fact that the world economy has continued its upward trend, it has however fluctuated only between one and four percent in the past few years. He further added that the highest rate was 4.1 percent in 2000 and the lowest was 1.4 percent in 2001. These figures and forecasts indicate that improving economic conditions will boost demand growth for petrochemical products. Nematzadeh added: “China is expected to represent around 30 percent of the growth in petrochemicals, given the increasing pace of its demand in the industrial sector. On the other hand, soaring energy prices and demand in North America has diverted investments from base products to finished goods”. According to Iran's NPC Managing Director, the Middle East, with its crude oil and gas resources, is a major supplier of energy to the world. He added that Iran and Qatar, harness the world's second and third largest natural gas reserves respectively, not only to supply a major part of the world's energy demand, but also to emerge as leading players in the world of petrochemicals. He also pointed out that while the Middle East supplies the greater part of the world's energy demands it exports only 4% of the global output of 510 million tons of basic chemicals, plastics, aromatics and fertilizers.